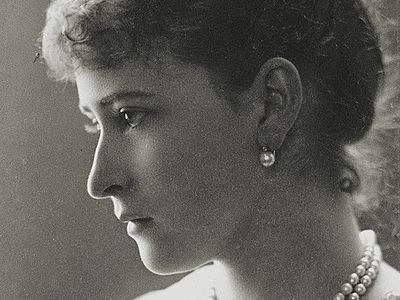 “O Lord, forgive them, for they know not what they do!” was the final prayer of Grand Duchess Elizabeth Feodorovna before the black abyss of an abandoned mine swallowed her. She went consciously to this yawning abyss, categorically refusing to leave Russia when the lawlessness began. She followed after Christ, and from that abyss the light of the Resurrection sprang forth to the eyes of her soul. What brought this aristocrat from a foreign country to the distant Ural city of Alapayevsk, her Golgotha? What gave her over to the hands of that mysterious diabolic evil in demonically possessed people? Their paths could never have crossed any earlier. She saw these people for the first and last time in her life. She met with them only in order that they might carry out that sentence pronounced by a court of unknown venue. But this is according to human judgment. And what about God’s judgment? In God’s judgment it was human judgment—“for God” or “against God”. And Grand Duchess Elizabeth Feodorovna, a former Protestant who had accepted Orthodoxy in her new homeland, in Russia, and who came to love the Orthodox Church in Russia, “even unto death”, answered to evil. No matter what sentence that newly unleashed, mad evil might have pronounced on her, she accepted it as a sentence from above, as an opportunity sent down to her to confirm in deed what constituted the meaning and content of her life. Love for God and love for mankind was the true meaning of her life, and it led the Grand Duchess to the cross. And her cross grew and met the Cross of Christ, and became her delight. The Grand Duchess lost her husband, who perished at the hands of an evil-intentioned terrorist. She gathered with her own hands what was left of her beloved, and bearing in her heart the pain of this terrible loss, she went to the criminal in prison with the Gospel in order to forgive him and bring him to Christ in repentance. All the rest of her life in Russia became a work of mercy and service to God and people. The grand duchess gathered a sisterhood and built the Martha and Mary Convent, serving all the deprived and sorrowful after the example of the two Gospel sisters. She put everything she owned to the last penny into this work, and gave herself entirely to it up to the last. Her love for people returned to her through people’s mutual love for her. Nun Barbara, who was with the grand duchess-abbess in the days of her labors, did not wish to leave her in her final podvig—death. And she seized a martyr’s crown through her self-sacrificing devotion. From the ruins and ashes of Russia, from the pain of a whole nation, from its countless deaths sounds the voice of holy sacrifice, affirming life: “Holy Russia and the Orthodox Church, against which ‘the gates of hell shall not prevail,’ exists, and exists more fully than they ever have.” These are the words written by her on the threshold of her grave. 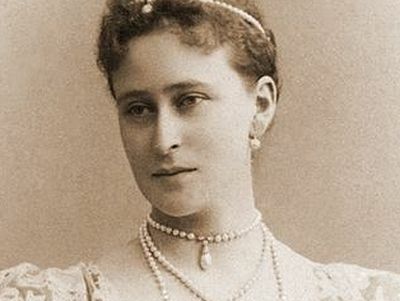 “I am sure,” continues the Grand Duchess, that the Lord Who punishes is the same Lord Who loves.” This was the measure of her spiritual maturity, the measure of her refinement. She herself had already voluntarily become a sacrifice, and the Lord accepted her sacrifice for Russia, which she so loved. And those executioners who came from who knows where onto her life’s path would not have had the slightest power over her had it not been given them from on high. All those who were with Grand Duchess Elizabeth were thrown alive into the mineshaft except for one who resisted. They did not die right away. For a long time the local people heard the Cherubic Hymn rising from beneath the earth. 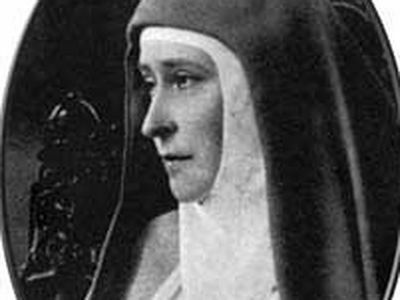 And the grand duchess there also, in their common grave, continued to do God’s work—the wounded head of one who was with her was bound by her apostolnik, her monastic veil. When three months after the martyrs’ death the place of their repose was found, it was seen that the grand duchess lay on a log shelf fifteen meters down, with an icon of the Savior on her breast, with which she had been blessed on the day she was united to the Orthodox Church. The righteous live forever! And the Russian New Martyrs are those awaited sacrifices of the Universal Church, who fill the ranks of those killed for God’s Word. And who knows how long the “lesser” apocalyptic time will go on, in which the earthly Church is ripening for the Divine Judgment, which shall bring vengeance upon those living on earth for the blood of the righteous? Martyrdom is the same thing as Christianity. These two words have the same meaning. Hatred against Christ and His followers should not surprise us. It is natural, it was foretold by the Lord Himself, Who said: “If the world hate you, ye know that it hated me before it hated you” (John 15:18). What sort of disciples would we then be, if we did not follow the footsteps of our Teacher? Such a great homily about a saint, by someone who is himself likely a saint of the Church, who himself trod the path of Golgotha for God’s people. St. Elizabeth was a Lutheran (likely christened by sprinkling) who was received into Orthodoxy by chrismation, by the sacred decree of the Russian Church. May all those super-correct hear and understand— the Church has the power to bind and loose, and may exercise economy in the reception of heterodox Christians. There is nothing modernist or ecumenist about such a practice. ''And who knows how long the “lesser” apocalyptic time will go on, in which the earthly Church is ripening for the Divine Judgment, which shall bring vengeance upon those living on earth for the blood of the righteous?''. Not long to go beloveds. Not long at all now for those who keep their eye on the words of our Holy Prophetic Fathers. And for those who understand Hellenic, listen to the blessed words of our ever wonderful father, Pater Avraam - https://www.youtube.com/watch?v=QXxWogvcwlY REPENT!!! REPENT!!! REPENT!!! PRAY!!! PRAY!!! PRAY!! !